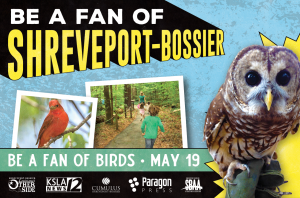 From May 1-31 you can enjoy some amazing deals and events during Be a Fan of Shreveport-Bossier month. This month is filled with 31 days of discounts at more than 25 local attractions. There are also giveaways and fun events you can attend including some amazing Bossier deals. You and your family won’t want to miss out on this opportunity to explore our great city. 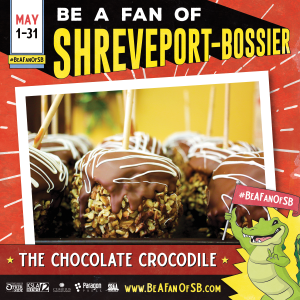 Be a Fan of Shreveport-Bossier is a project of the Shreveport-Bossier Convention and Tourist Bureau and the Shreveport-Bossier Attractions Association. Brandy Evans, Vice President of Communications for the Shreveport-Bossier Convention and Tourist Bureau, explains how they came up with the name for the project. Along with some great discounts, there will be two Be a Fan events in Bossier. One event is Paint Your Pour. This is a unique painting experience where friends can gather to create one of a kind artsy drinkware pieces. The event will be held at Flying Heart Brewing & Pub. 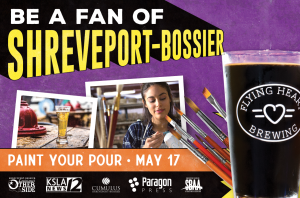 Drinkware, paint, brushes and care instructions are being supplied by the Bossier Arts Council (BAC). Elizabeth Pattillo, sales siren for Flying Heart, says as a small business they feel it is important to help out the local community. They enjoy working with the Bossier Arts Council when they can. When: Thursday, May 17 from 6:30 p.m. to 8:30 p.m.
Tickets are $15. Use the BEAFAN promo code online and get HALF OFF the purchase of your ticket. Also, use “Be A Fan” when you arrive with your paid tickets and get your first beer for $4. You can purchase tickets here. Be a Fan of Birds! Another event is one that nature lovers will definitely enjoy. Be a Fan of Birds is a great way to explore the outdoors and our feathered friends at Red River National Wildlife Refuge Visitor Center. There will be bird-watching from 9 a.m. to 12 p.m. Binoculars will be provided along with a brief overview of the types of birds you might see. Come by early to take a hike and connect with nature. Admission is free. When: Saturday, May 19 from 9 a.m. to 12 p.m.
Join Chef Hardette Harris on a culinary expedition by going on the “Us Up North” Be a Fan of Shreveport-Bossier Food Tour. Bossier’s own Lucky Palace Chinese Restaurant will be a stop on this tasty tour serving up some of the best dishes this area has to offer. Limited seats are available, so don’t wait to purchase yours. Tickets are $50 per person. Food and drinks are included in the ticket price. You can purchase tickets here. When: Saturday, May 26 from 11 a.m. to 2:30 p.m. These are some Bossier deals that you can take advantage of by mentioning, “Be a Fan.” Click on each deal to find out more info. You can take advantage of these Bossier deals, and visit the Tourist Bureau’s website for more info on Be a Fan of Shreveport-Bossier month. Next Post:Do You Know the History of Benton?